At just 19 years old, celebrated actress and activist Yara Shahidi has us all coveting her sensational designer wardrobe. Her acting skills have long been celebrated but in recent years she has also become a true style icon. You’ll feel eternally chic and sophisticated when slipping into any one of the dresses from our Yara inspired edit. Yara Shahidi certainly knows the power of a well constructed, timeless dress. Opt for beauty in simplicity at your next event with the Wow wool crepe fit &flare dress by Lisa Perry. This classic fit and flare silhouette is not only stylish but also wonderfully flattering. Additionally, this dress is amazingly versatile. It can be styled with a wide variety of shoes and accessories, for a wide variety of events. The Jewel neck and side on-seam pockets are in-keeping with this minimal dress whilst adding a designer touch. For a truly elegant approach to your evening style, opt for the Champagne lace insert slip dress by Topshop. This beautiful slip dress has a sultry open back in addition to the statement thigh high splits in the maxi length skirt. The opulent champagne hue instantly declares luxuriousness whilst the floor length skirt sweeps as you move. As we have learned from Yara Shahidi’s many faultless turns on the red carpet, proudly expressing your personality always look fabulous. Never be afraid to use your style choices to showcase your individuality and creativity when you step out for an event. The Encanto silk floral printed gown by Johanna Ortiz, for example, is full of charm and truly makes a statement. A flamenco style ruffle decorates the one shoulder design which is incredibly beautiful and eye-catching. 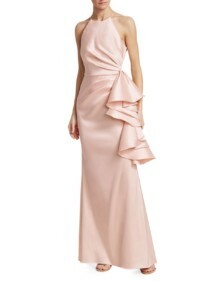 Additionally, the back tie cinches the waist for a flattering silhouette whilst accentuating the twisted cutout front. 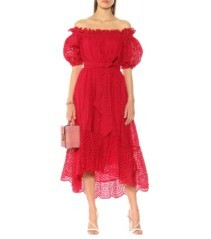 Style this with heeled sandals and statement earrings for your first spring/summer gathering of 2019. 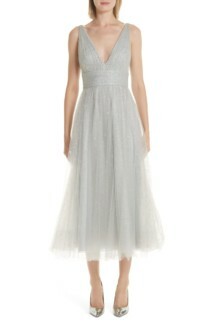 The perfect knee length option for your next event comes in the form of the Valeria ivory dress by Cinq A Sept. This incredibly pretty chiffon dress incorporates a V-back and charming bow accents on the shoulders. 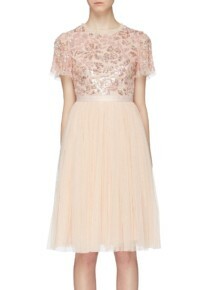 Style this romantic dress with simple heels this spring.